As usual, there's been a few months since my last posts. As one of my fall resolutions is to be a much more frequent blogger, both here and over at The Bubble Chamber, you'll be hearing much more about me and the endless quest for productivity in grad school. I want to share my summer success story. While on vacation in Maine at the beginning of the summer, I came across The Complete Idiot's Guide to Overcoming Procrastination at Barnes & Noble. It was a peculiar reading choice during the summer break, but since I was trying to put off the research paper I was purportedly working on at the time, I worked my way through. This book is not a cakewalk, despite its title. Michelle Tullier makes you take a long, hard look at your habits and gets you to face the things motivating your procrastination head-on. She deals with the kinds of excuses we make to ourselves when we put things off to do later; things in our surroundings that we use as excuses to avoid work (I didn't have the right book, it was too noisy at the library) and the inner monologues in justification of our procrastination (I'll do it right after I...). There are also tons of concrete tips to get things done, organize your office, keep the house clean, etc. One thing I didn't agree with is her characterization of grad school as a place where there is less procrastination than undergrad, because supposedly at this stage we're much more focussed on our research and self-motivated. My experience has been that procrastination is rampant in grad school, as water-cooler conversation and as a daily challenge for those of us trying to get things done. In the second year of our program we write a major research paper (the 2000 paper, since this is the course code, and not for its 2000 pages, 2000 hours of work, or 2000 pounds of weight on your mind, as my father recently suggested). Most students don't get to work until the late spring, as it's due in August. I attacked my research "proactively" and met frequently with my supervisor, who reassured me that starting so early meant I had plenty of time. By the middle of July I had a well-annotated bibliography, but I increasingly found myself lethargic, not interested in starting to write or read anything, and generally wishing to fast forward to September 1st. One night in late July, having done nothing all day but read online comics, I decided to get something done so the day wasn't a total waste. I changed from PJs into real clothes... and took out the trash. On the walk back, I was struck by the ludicrousness of the situation: I was miserable because I had all this work to do, but I refused to commit to doing it. I Immediately came up with a plan. I would write 3 pages every day for 2 weeks, starting August 1st. They didn't have to be perfect pages, or even coherent ones, as long as there were three of them. 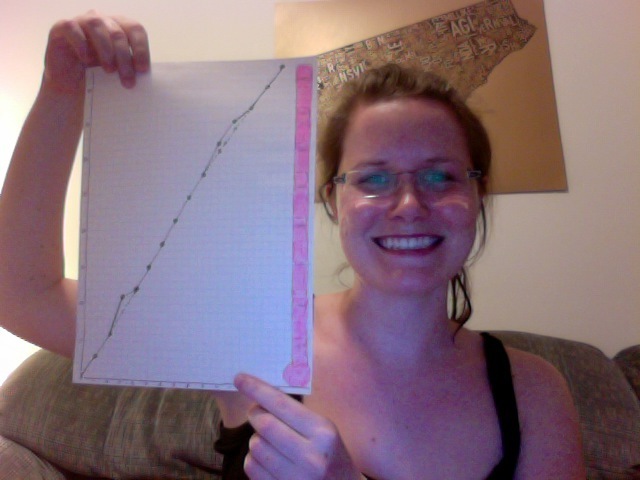 I also committed to document my progress on a graph that would live on the fridge. Every night I had to mark my progress on the graph, NO MATTER WHAT. I even plotted an "expected" progress curve to compare with my actual progress. I also told all my friends about this plan, ensuring that I'd be frequently asked whether I had done my pages for the day. It worked out perfectly. By externalizing the motivation, I had tuned into energy I hadn't had for academic work for a long time. Sometimes I'd be on a roll and write 4 or 5 pages; on the next day I generally wrote less and ended up back on the expected line. I started to realize that if I could get my pages done earlier in the day, there was plenty of time left to enjoy the summer, as opposed to leaving them for the end of the day and having them on my mind the whole time. Of course, many pages were written in the wee hours of the next day, for fear of being a disappointment to the fridge graph, but far fewer than my typical grad school course paper. I didn't pull any all-nighters to get this done, and by the 14th I had a complete draft. I don't know whether the graph system will work for you. Having an external motivation was exactly what I needed to turn my summer around. I don't know when the next time I'll be writing a big paper will be, but there will definitely be another fridge graph to keep me on track.